Christmas is coming, and Cat has a hunch he's not on Santa's "nice" list. Which means? No presents for Cat. So he tries to be good, but Cat and tree-decorating don't exactly mix, and children, it seems, aren't wild for his brand of gift-giving. 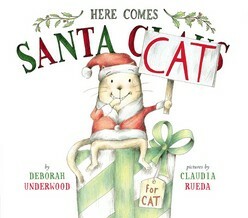 Still, this holiday, Cat might surprise even himself with his generosity and leave the Grinchiest of readers laughing. Best of all, he may just get to meet the man in the red suit himself—and receive a holiday surprise of his own. There's a new lovable, laughable, irascible cat joining the Christmas crew, and he's bringing gifts!